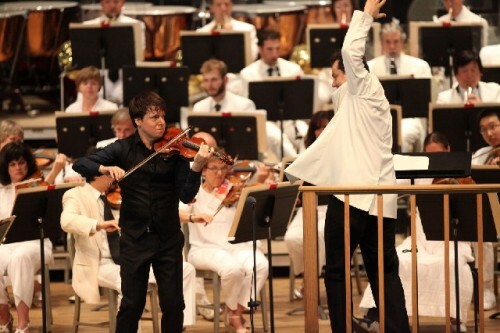 Joshua Bell and Andris Nelsons. BSO photo by Hilary Scot. Bells 26th Tangewoood appearance. BSO photo. Nelsons stretching out. BSO photo. Interacting with fans. Philip Kampe photo. It didn’t take long for me to become a devout fan of Joshua Bell. 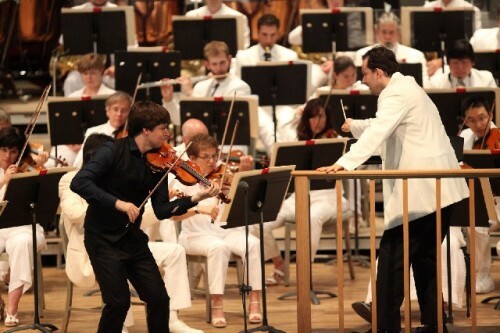 Maybe it is his charisma or perhaps that he has played at Tanglewood for the past 26 years in a row. It is a feat accomplished by no other artist. As a viewer and critic of years of concerts at Tanglewood, it was obvious that the popularity of Bell rivals that of hometown favorite, James Taylor. 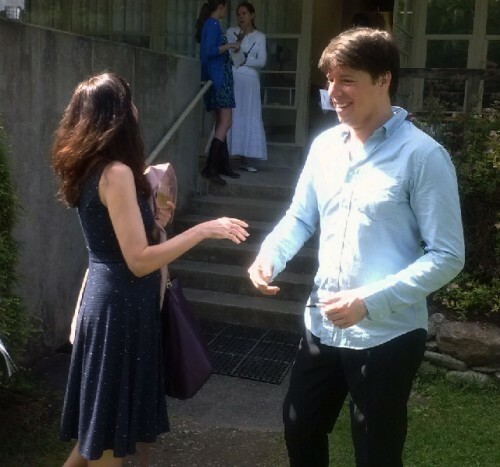 What makes Joshua Bell so popular? My wife says his good looks help. Joshua was voted one of the most beautiful people in the world by People magazine. Arguably it is his smile and positive personality. Maybe it his seductive way of playing the violin. Maybe it the ‘whole package’? Whatever it is, Joshua Bell relies on his talent and ability to play the violin like an obsession. The instrument has been his friend, since the age of four. Playing Lalo’s ‘Symphonie Espagnole' the full-house witnessed a passionate approach to a piece written at the beginning of a French fascination with Spanish themed music. 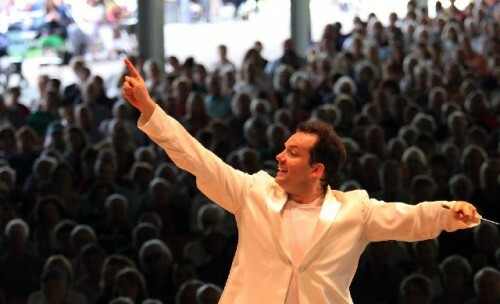 The piece has five movements suggesting that Andris Nelsons symphony will play the supporting role. And that is what they did—with tenacity and poise, the two played like one. Joshua Bell is a gifted and overly talented musician who can both ‘steal the show’ or be ‘part of the show’. This afternoon, he was both—a larger than life gypsy violinist and a focused musician under the direction of Tanglwoods’ new guru conductor, Andris Nelsons.